Setting up SMS can be completed in a few steps. 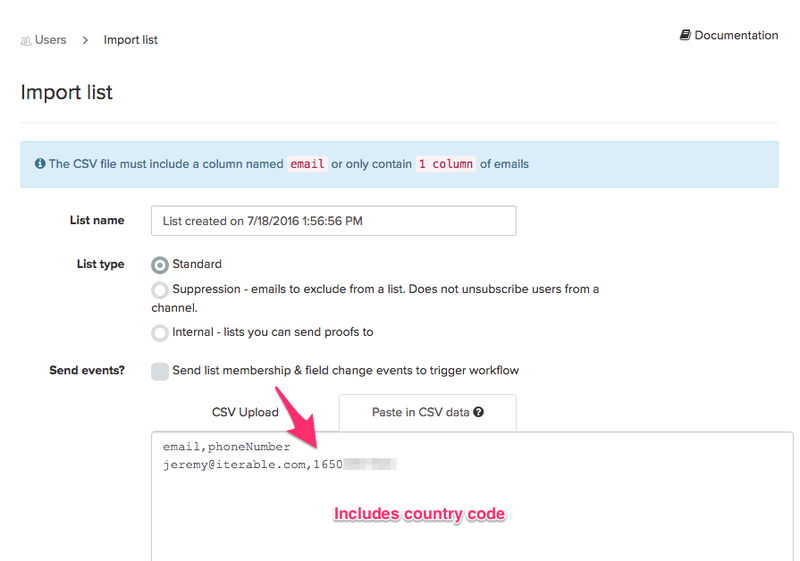 Once Twilio is added as a sender account into Iterable, you can begin sending SMS campaigns to your users. #Do I need a Twilio account? Iterable has a native integration with Twilio. You do not need your own account, however, we can accommodate if you already have an existing Twilio account. Your Twilio connection will be set up by your implementation manager or customer success manager. Reach out to them to discuss which option is best for you. Long codes are general use phone numbers available for a smaller daily use. They typically work with voice, SMS, and MMS. These are normally available for purchase immediately and can be used to send up to 1 message per second. The majority of customers will use long codes. There is a recommended limit of 250 sends per day with long codes. Short codes are 5 or 6 digit numbers bought for a large volume of SMS/MMS sends and replies, and require a lease for national registry for a minimum of three months. This process may take 8-12 weeks to complete and costs more than long codes. Customers with a much larger user base, who also desire higher sending limits (30 messages per second by default) may consider purchasing short codes. Iterable does not currently provide support for sending voice messages or inbound MMS sent to your phone numbers from your users. After setup is completed by you or your customer success manager, your users must have a user field with the name phoneNumber. Phone numbers must also be in the proper format and must include a country code. If my phone number is (650) 392-6753 (650-example), then the phoneNumber field must be added as 16503926753.
International phone numbers must include a plus sign (+) in front. For example, for a German number, whose country code is 49, it must be added in the format of +496503926753. From here, you can go ahead and send yourself or others a test SMS message. You can create SMS templates quickly and simply. Handlebars will work in SMS templates as they do in email templates. You can send an SMS message through blast campaigns, triggered campaigns, and within workflows. If a user does not have the phoneNumber field, that user will be ignored by the SMS send. All users' responses can be viewed by going to the Users > Inbound SMS page. If you would like to set up a workflow to respond to these messages, use the Received An SMS trigger in workflows. All filters and actions are available to use as normal in response. Using these features, you can set up a number of different automated responses based on the user's response. For example, if the user's SMS message contains Yes, further filters can be used to see if they have a Free_Pizza event. This could be used to determine who is eligible for a coupon or promo. #Does Iterable provide phone number validation? Iterable does not provide validation, but you can use Twilio's free tool to validate your users'phoneNumber fields. #Can I send images along with my text messages? Yes, Iterable accepts URLs to .png, .jpeg, and .gif files. Insert the URL of the image into the Image Url box in the SMS template editor. ##3 Can I send videos, or other file types in my messages? Yes. As long as the file is 5mb or smaller, and as long as you have a link to the supported file type, you can include that in the Image Url section of the template editor to send the content. Read Twilio's Accepted Content Types for Media document for a list of acceptable file types. #What metrics can I use with SMS? To learn about SMS metrics, read SMS campaign metrics. #Why would an SMS message bounce? Bounces can happen if a number doesn't exist or if part of the setup is incorrect. At this time, Iterable does not unsubscribe users when they bounce. For an exhaustive list of error codes, read Twilio's error documentation. #How do users unsubscribe from messages? #Is there a minimum number of SMS sends I will use before requesting SMS capability? Yes, Iterable's starting SMS packages include a volume of 25,000 SMS messages per month.